Charles Joel Nordström Kinnaman (born 25 November 1979) is a Swedish and American actor who first gained recognition for his roles in the Swedish film Easy Money and the Johan Falk crime series. 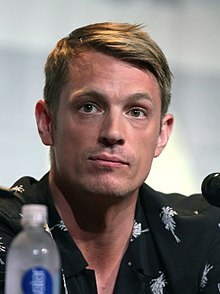 Kinnaman is known internationally for his television roles as Detective Stephen Holder in AMC's The Killing, Takeshi Kovacs in the first season of Altered Carbon, and Governor Will Conway in the U.S. version of House of Cards. He has also played Alex Murphy in the 2014 RoboCop remake, and Rick Flag in the film adaptation of Suicide Squad (2016), based on the DC Comics anti-hero team of the same title. Kinnaman was born and raised in Stockholm. His mother, Bitte, a therapist, is a Swedish citizen. His father, Steve Kinnaman (originally David Kinnaman), is an American who was drafted during the Vietnam War and deserted the military from his base in Bangkok. Kinnaman has both Swedish and American citizenship. Kinnaman's father, whose family was from the American Midwest, is of Irish and Scottish descent, while Kinnaman's mother is Jewish (of Ukrainian-Jewish descent). He has five sisters, one of whom is actress Melinda Kinnaman (his half-sister). During his childhood, Kinnaman learned two languages as he "spoke English with my dad and Swedish with my mom." Kinnaman spent a year in Del Valle, Texas as a high school exchange student. After high school, he decided to travel around the world. To finance the trip, he worked in various jobs—as a beer factory line worker and roof-sweeper in Norway, and as a bar manager in the French Alps. Kinnaman then travelled for two years in Southeast Asia and South America. Kinnaman began his acting career as a child actor in 1990, with a role in the soap opera Storstad. His older sister was dating one of the show's directors, and he asked Kinnaman to audition for a part on the show. After portraying Felix Lundström in 22 episodes, he stepped away from acting. Kinnaman restarted his acting career in 2002. While studying at drama school, Kinnaman featured in several films such as Hannah med H and God Save the King (Swedish: Tjenare kungen). He graduated from Malmö Theatre Academy in 2007, and attracted the attention of Swedish media with the role of Raskolnikov in a stage adaptation of Crime and Punishment. Kinnaman went on to star in nine Swedish films in 14 months. In 2009, he starred in the film In Your Veins (Swedish: I skuggan av värmen) and played the role of a police informant in six films of the Johan Falk film series. He was cast in the film Easy Money (released January 2010), which brought him mainstream attention in Sweden and at the international film market, and also earned him a Guldbagge Award in the Best Actor category. Looking to expand his acting career, Kinnaman hired an agent in the United States. It was announced in the spring of 2010 that he would be making his international film debut in the thriller The Darkest Hour, which began filming in Moscow in June 2010 and was released in December 2011. Beginning in April 2011, Kinnaman had a starring role as Detective Stephen Holder in the AMC television series The Killing. Kinnaman was one of the contenders for the lead roles in Thor (2011) and Mad Max: Fury Road (2015). Although Kinnaman said that he is eager to work and become recognized in the U.S., he added that "I absolutely don't feel that I have to take any role that I can get just because it is the United States. I'm looking for something interesting, I'm still young in my artistry, and I must dare to do things even when there's a risk for failure". In 2012, Kinnaman reunited with Easy Money director Daniel Espinosa in the latter's Hollywood debut, Safe House, and also starred in the indie film Lola Versus. On 3 March 2012, it was confirmed that Kinnaman would play the lead role of Alex James Murphy/RoboCop in the 2014 remake of 1987's RoboCop. The film was released in February 2014. In 2015, he appeared in the drama Knight of Cups and starred in the thrillers Run All Night and Child 44. Kinnaman played Rick Flag Jr. in the Warner Bros. and DC Comics adaptation of Suicide Squad (2016), directed by David Ayer. In 2016, Kinnaman starred in the independent drama-thriller film Edge of Winter. He plays Elliot Baker, a father of two who takes his children on a shooting trip that goes wrong. The film was released on demand on 27 July, and in select theatres on 12 August. Kinnaman was cast as the protagonist Takeshi Kovacs in Netflix's Altered Carbon, an adaption to Richard K. Morgan's hardboiled cyberpunk science fiction novel of the same title; the first season of the Netflix science fiction series debuted on 2 February 2018. On 8 February 2018, it was announced that the actor was cast as Erik in the Amazon series Hanna, an adaptation of the 2011 action film of the same title. In August 2018, Kinnaman was cast as Edward Baldwin in Ronald D. Moore's series, For All Mankind, which will be available as part of the original programming on Apple's upcoming streaming service. In mid-2014, Kinnaman began dating Swedish tattoo artist Cleo Wattenström. In April 2016, Kinnaman revealed he and Wattenström were married. They separated in 2018. ^ a b c "Joel Kinnaman". The Swedish Film Database (in Swedish). Swedish Film Institute. Retrieved 30 April 2014. ^ a b c Rehlin, Gunnar (7 April 2010). "Joel Kinnaman klar för Hollywoodfilm". Helsingborgs Dagblad. Archived from the original on 17 July 2011. Retrieved 18 July 2010. ^ a b Hägred, Per (19 January 2010). "Joel Kinnaman: 'Min revisor är i chocktillstånd'". Expressen. Retrieved 18 July 2010. ^ a b c d Rochlinfer, Margy (7 February 2014). "Emotions Churning Under Armor: Joel Kinnaman Jumps From 'The Killing' to 'RoboCop'". The New York Times. Retrieved 30 April 2014. ^ Jackson, Helen (6 February 2014). "Robocop Joel Kinnaman's Mom Tried to Send Him to Therapy for Walking Like a Robot". Variety. ^ Yglesias, Matthew. "Joel Kinnaman from The Killing: An Interview". Slate. Retrieved 2 July 2012. ^ Wennersten, Lina. "Kroppslig kamp". Svd.se (in Swedish). Retrieved 2 July 2012. ^ Ventre, Michael (16 June 2011). "Killing actors all hiding secrets". Variety. ^ Barker, Emma (2 April 2012). "Making a 'Killing'". TheDaily.com. Archived from the original on 13 September 2012. Retrieved 30 January 2018. ^ "Joel Kinnaman regerar i "Arn" – Film". Arbetarbladet (in Swedish). 22 August 2008. Archived from the original on 29 June 2012. Retrieved 2 July 2012. ^ Dekel, Yanir (23 February 2014). "RoboCop's Jewish!". The Shmooze. ^ a b c Andersson, Jan-Olov (22 August 2009). "Jag fick sparka ihjäl Skarsgård". Aftonbladet. Retrieved 18 July 2010. ^ a b Albiniak, Paige (1 May 2011). "In for the kill". The New York Post. ^ "How Joel Kinnaman Became a Sci-Fi TV Star (and Lived to Tell About It)". Rolling Stone. Retrieved 30 April 2018. ^ a b Röshammar, Martin (18 August 2012). "Joel Kinnaman siktar på toppen". Göteborgs-Posten (in Swedish). Retrieved 30 April 2018. ^ Arnell, Av Lisa (15 September 2012). "Helgläsning: Joel Kinnaman". ELLE (in Swedish). ^ Romano, Tricia (25 May 2012). "Joel Kinnaman: 'The Killing's' Scene-Stealer". The Daily Beast. Retrieved 30 April 2018. ^ "Jag ville slå honom". Aftonbladet. Retrieved 24 November 2016. ^ Gradvall, Jan (2 September 2012). "Intervju med Joel Kinnaman". Gradvall.se. Retrieved 24 November 2016. ^ Lundgren, Åke (24 April 2007). "Brott och straff" [Crime and punishment]. Expressen (in Swedish). ^ a b Wennö, Nicholas (15 January 2010). "Den begåvade mr Kinnaman". Dagens Nyheter (in Swedish). ^ Engström, Emma (3 May 2009). "Kinnaman har en regissör i magen". Göteborgs-Posten (in Swedish). Retrieved 30 April 2018. ^ a b c d e f Helmerson, Erik (11 January 2010). "Joel Kinnaman nära roll i Mad Max 4". Östran. Archived from the original on 23 January 2010. Retrieved 18 July 2010. ^ "Zac Efron to play drug smuggler in thriller". Reuters. 15 April 2010. Retrieved 18 July 2010. ^ Lindqvist, Johan (24 January 2011). "Sebbe årets bästa film". Göteborgs-Posten (in Swedish). ^ Holmqvist, Emilia (22 March 2010). "Kinnaman ska få oss att springa". Aftonbladet. Retrieved 18 July 2010. ^ Hibberd, James (14 April 2010). "AMC adds four actors to Killing pilot". The Hollywood Reporter. Retrieved 18 July 2010. ^ Vejvoda, Jim (16 March 2009). "Natalie Portman Joining Thor?". IGN. Retrieved 18 July 2010. ^ Vineyard, Jen (11 July 2012). "Joel Kinnaman Talks Easy Money, His Marty Scorsese-Style Relationship With Daniel Espinosa & The Future Of The Dragon Tattoo Films". IndieWire. ^ Vineyard, Jennifer (8 June 2012). "Joel Kinnaman on Lola Versus, Bulking Up for RoboCop, and Who Killed Rosie Larsen". Vulture. ^ Kroll, Justin (13 February 2015). "Joel Kinnaman eyed for Rick Flagg role in Suicide Squad". Variety. ^ "'Suicide Squad' Update: 'RoboCop's Joel Kinnaman Cast as Rick Flagg". Screenrant. 13 February 2015. ^ "Edge of Winter actor Joel Kinnaman says 'toughest shoot' was filming in a freezing Sudbury lake". The Hamilton Spectator. 23 August 2016. ^ a b Andreeva, Nellie (12 May 2016). "Joel Kinnaman to star in Netflix's Altered Carbon series; Miguel Sapochnik directs". Deadline Hollywood. ^ "'Altered Carbon': How Joel Kinnaman's Exit Could Impact Season 2". The Hollywood Reporter. Retrieved 12 May 2018. ^ Lloyd, Robert. "Netflix's 'Altered Carbon' may be long and complicated, but it's good to have Joel Kinnaman back". Los Angeles Times. Retrieved 2 March 2018. ^ Otterson, Joe (8 February 2018). "'Hanna' Amazon Series Casts Esme Creed-Miles, Joel Kinnaman, Mireille Enos in Lead Roles". Variety. Retrieved 2 March 2018. ^ Andreeva, Nellie; Andreeva, Nellie (14 August 2018). "Joel Kinnaman, Sarah Jones & Michael Dorman To Star In Ron Moore's Apple Space Series". Deadline. ^ "Här myser Kinnaman med svenska Cleo, 22". Aftonbladet. 9 August 2014. Retrieved 30 June 2015. ^ Bacardi, Francesca (26 April 2016). "Surprise! Joel Kinnaman and Cleo Wattenström Are Married". Eonline.com. Retrieved 26 April 2016. ^ Gugliemi, Jodi (26 April 2016). "Joel Kinnaman Reveals He Secretly Married Cleo Wattenström". People. Retrieved 26 April 2016. ^ Hearon, Sarah (23 January 2019). "Joel Kinnaman, Cleo Wattenstrom Split After 2 Years of Marriage". Usmagazine.com. Retrieved 14 March 2019. ^ "Joel Kinnaman skiljer sig frĂĽn Cleo WattenstrĂśm | Aftonbladet". Aftonbladet.se. Retrieved 14 March 2019. ^ "De kan vinna en Guldbagge". Dagens Nyheter. 8 January 2010. Retrieved 18 July 2010. ^ Goldberg, Matt (29 February 2012). "Saturn Award Nominations Announced; Hugo and Harry Potter Lead with 10 Nominations Each". Collider. Retrieved 22 March 2014. This page is based on the Wikipedia article Joel Kinnaman; it is used under the Creative Commons Attribution-ShareAlike 3.0 Unported License (CC-BY-SA). You may redistribute it, verbatim or modified, providing that you comply with the terms of the CC-BY-SA.